I have no idea where the reference for this is. It was either a youtube vid, a comment on fb or G+. Some of the idea probably came from +Eric from Bloat Games new video podcast. https://www.youtube.com/watch?v=GToz4TWBE78 (there was a reference to how many times Matts paladin became an anti paladin). Whatever the case, the question was "What's a character that you model your characters afterwards". I've got the sneaky suspicion that some people pick a archetype that they like, and regardless of whether that character dies, the next one is in a similar vein. For instance you are partial to robin hood, so your first PC you roll up as close as you can get to him, and so one once the first guy dies. I'm fairly positive that back in the 2nd edition hey day of Drizzt, well there was a LOT of Drizzts wasn't there! This got me to thinking about the characters I've played. Honestly I think I'm just trying to find my way still. I don't think I'm stuck on a particular character to emulate. The last few times I've played a background cleric kinda of character (Which doesn't have a ton of cultural literary references, other than Friar tuck... that I can think of). In our current 5e game I'm playing a rogue, borderline assassin. Which comes from Skyrim more than any literary example. I just like being that evil character. All those jerks from the dark side and other villains in movies appeal to me. Although I still don;t think I modeled a character directly after someone. Now that I'm thinking about it, Kylo would be interesting to play. My old school group has shown interest in running a Star wars D6 game. When I do I think rather than letting them create characters (because they will all end up as gray jedi), I'd rather take the stock pre gens in the back and blindly hand them out. I know everyone has a favourite character, but with star wars you probably can't go wrong with an archetype really. Especially for fan boys/girls. 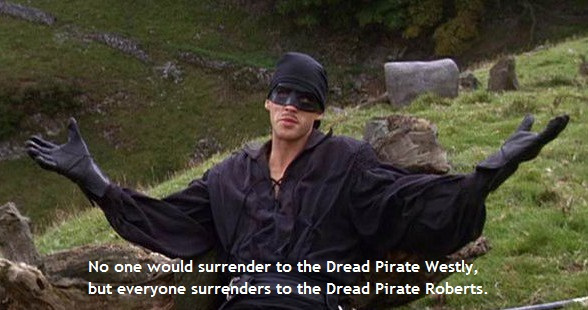 My wife one time created a female version of the Dread Pirate Roberts, which was so much fun for her. I think its probably hard to not emulate characters once in awhile. When I say barbarian, I'm sure Conan or Red Sonja is the first thing you think of right? So is there a character type that you emulate when you play?